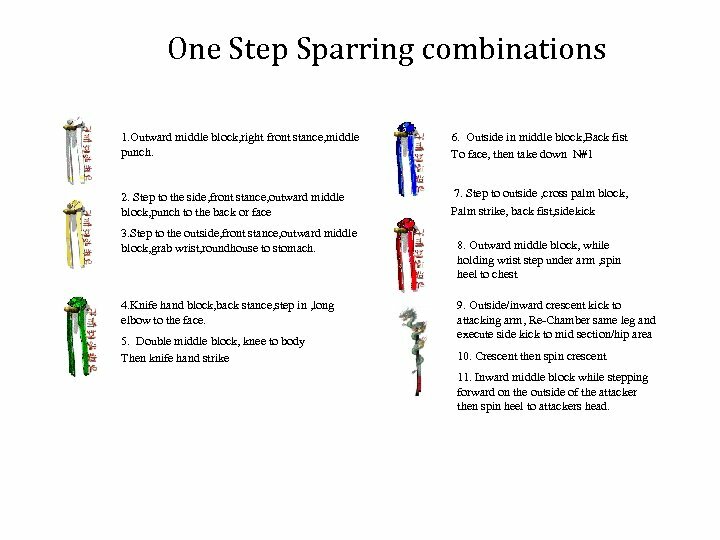 One Step Sparring combinations 1. Outward middle block, right front stance, middle punch. 6. Outside in middle block, Back fist To face, then take down N#1 2. Step to the side, front stance, outward middle block, punch to the back or face 7. Step to outside , cross palm block, Palm strike, back fist, sidekick 3. Step to the outside, front stance, outward middle block, grab wrist, roundhouse to stomach. 4. Knife hand block, back stance, step in , long elbow to the face. 5. Double middle block, knee to body Then knife hand strike 8. Outward middle block, while holding wrist step under arm , spin heel to chest 9. 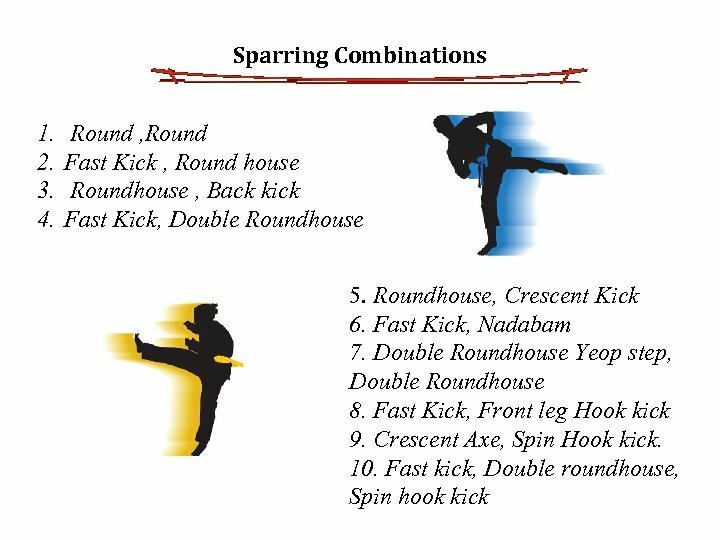 Outside/inward crescent kick to attacking arm, Re-Chamber same leg and execute side kick to mid section/hip area 10. Crescent then spin crescent 11. Inward middle block while stepping forward on the outside of the attacker then spin heel to attackers head. 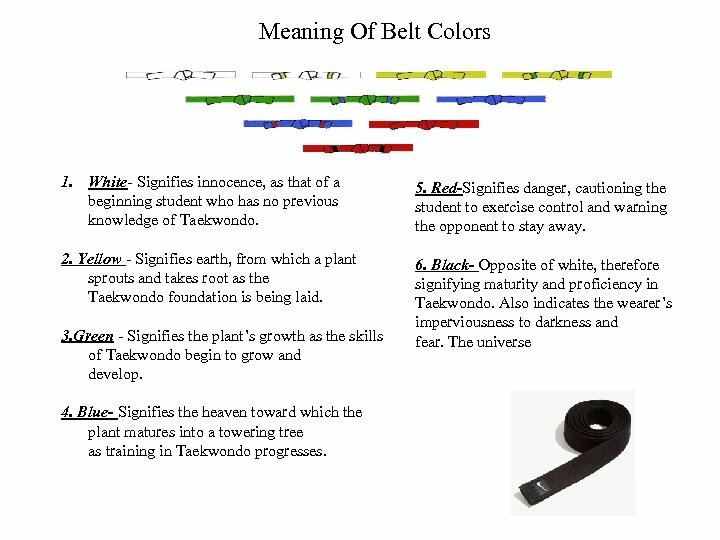 Meaning Of Belt Colors 1. White- Signifies innocence, as that of a beginning student who has no previous knowledge of Taekwondo. 5. Red-Signifies danger, cautioning the student to exercise control and warning the opponent to stay away. 2. Yellow - Signifies earth, from which a plant sprouts and takes root as the Taekwondo foundation is being laid. 6. 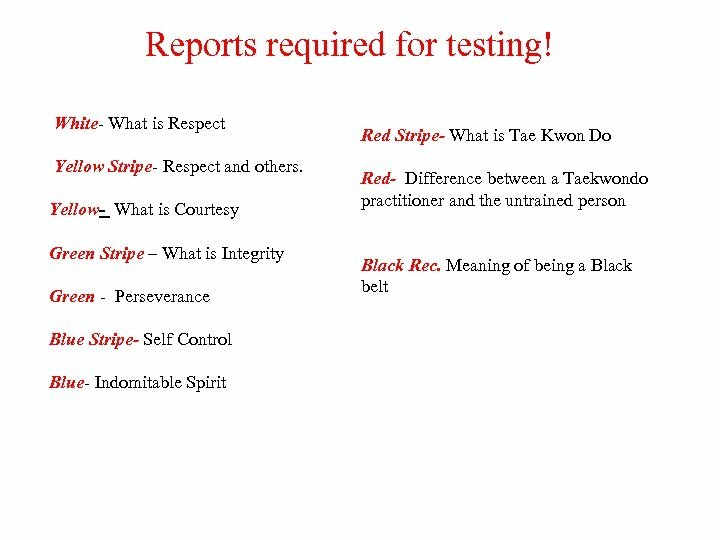 Black- Opposite of white, therefore signifying maturity and proficiency in Taekwondo. Also indicates the wearer’s imperviousness to darkness and fear. The universe 3. Green - Signifies the plant’s growth as the skills of Taekwondo begin to grow and develop. 4. Blue- Signifies the heaven toward which the plant matures into a towering tree as training in Taekwondo progresses. 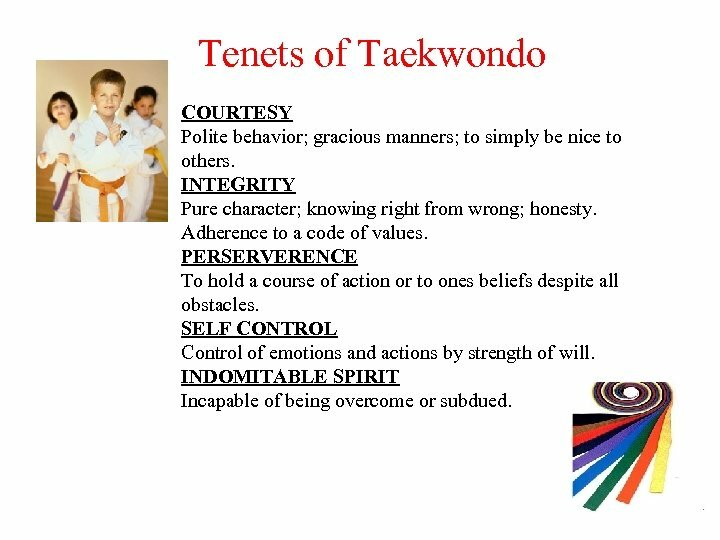 Tenets of Taekwondo COURTESY Polite behavior; gracious manners; to simply be nice to others. INTEGRITY Pure character; knowing right from wrong; honesty. Adherence to a code of values. PERSERVERENCE To hold a course of action or to ones beliefs despite all obstacles. SELF CONTROL Control of emotions and actions by strength of will. INDOMITABLE SPIRIT Incapable of being overcome or subdued. 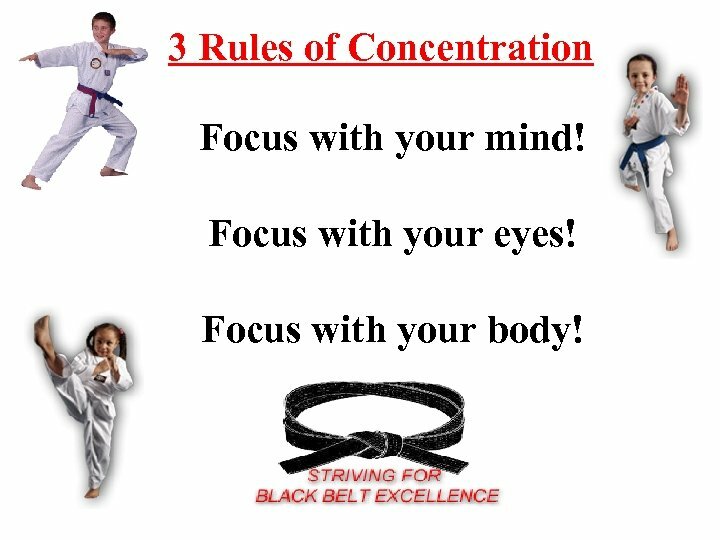 3 Rules of Concentration Focus with your mind! Focus with your eyes! Focus with your body! 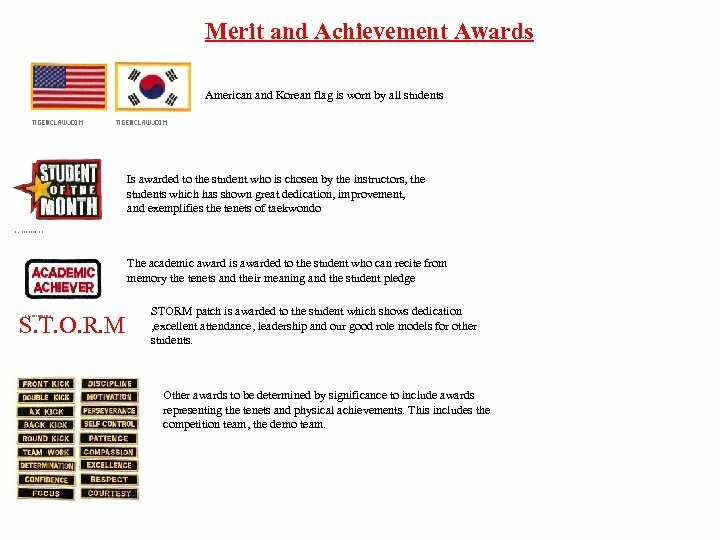 Merit and Achievement Awards American and Korean flag is worn by all students Is awarded to the student who is chosen by the instructors, the students which has shown great dedication, improvement, and exemplifies the tenets of taekwondo The academic award is awarded to the student who can recite from memory the tenets and their meaning and the student pledge S. T. O. R. M STORM patch is awarded to the student which shows dedication , excellent attendance, leadership and our good role models for other students. Other awards to be determined by significance to include awards representing the tenets and physical achievements. This includes the competition team, the demo team. 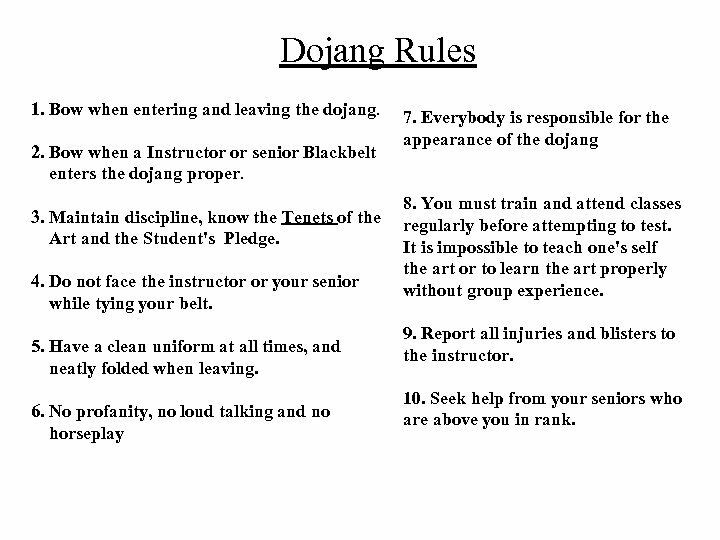 Dojang Rules 1. 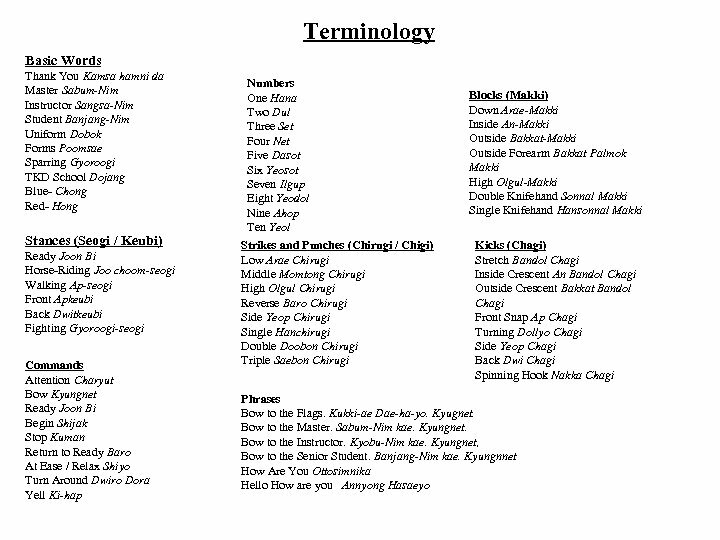 Bow when entering and leaving the dojang. 2. Bow when a Instructor or senior Blackbelt enters the dojang proper. 3. Maintain discipline, know the Tenets of the Art and the Student's Pledge. 4. 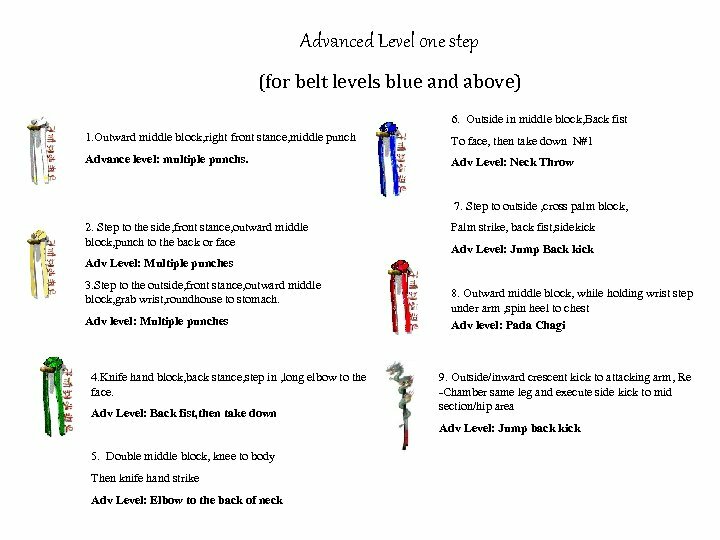 Do not face the instructor or your senior while tying your belt. 5. Have a clean uniform at all times, and neatly folded when leaving. 6. No profanity, no loud talking and no horseplay 7. Everybody is responsible for the appearance of the dojang 8. You must train and attend classes regularly before attempting to test. It is impossible to teach one's self the art or to learn the art properly without group experience. 9. Report all injuries and blisters to the instructor. 10. Seek help from your seniors who are above you in rank.